I had the opportunity to catch the opening reception of Alternate Realities, an art exhibit sponsored by the Knoxville Arts and Culture Alliance at the Emporium Center in Knoxville, Tennessee. My friend Geri Forkner, a talented mixed media weaving and felting artist, had several of her pieces on display in the show beside work by artists Elizabeth Porter and Carl Gombert. made from found and discarded materials. 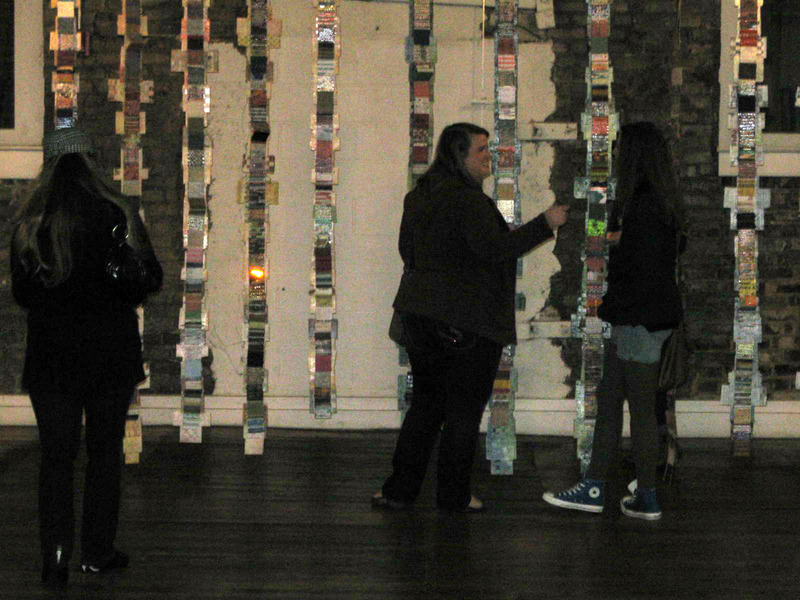 This piece reflects 2 years of weavings. Electronic components are incorporated throughout the piece. See other photos (photographed in the daytime) here. For the past few years, Geri has been studying and experimenting with electronic components and how to incorporate this technology into her weavings, wearables and felting art. The large installation above, Daily Weaving, incorporates battery powered lights within the free-hanging woven pieces. Below, Geri is wearing a woven vest made from recycled papers and salvaged packaging materials. Her felted floral broach incorporates conductive thread and fiber optics. 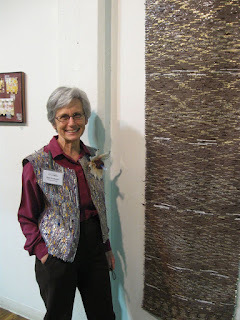 She is standing beside a weaving created from recycled coffee bags. The coffee packaging material offers a subtle reflectance that gives richness to the browns and copper tones. Mixed media weaving artist, Geri Forkner. I was also inspired by the Radiant Geometries exhibit of Carl Gombert's pen and ink and hand-stamped ink work. I found some potential fodder for my free-motion quilting experiments in his pen and ink drawings. Both exhibits go through January 25, 2013. Check them out, if you are in the Knoxville area. 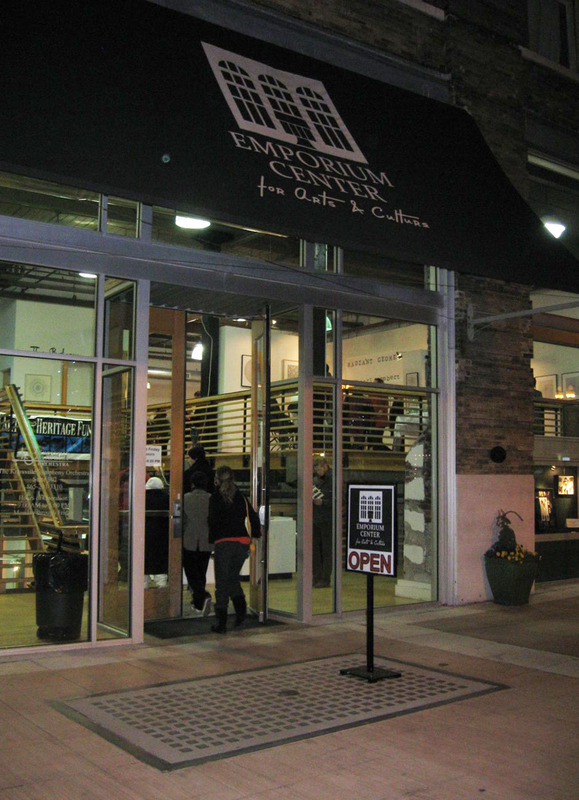 The Emporium is a great space with large upper and lower galleries. Another very talented friend of mine is machine quilter extraordinaire, Margo Clabo. I saw this quilt during a recent visit to Chattanooga Quilts quilt shop. It is a sample piece promoting a Borders class that was team taught by shop owner, Kim Thomas, and quilting instructors Mellissa, Karen and my friend Margo. 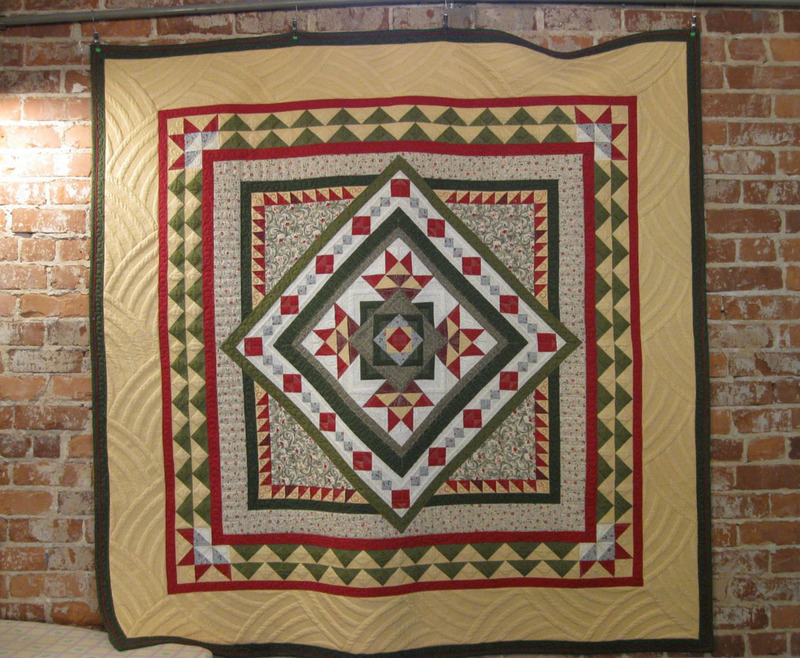 Medallion quilt at Chattanooga Quilts, Ooltewah, TN. 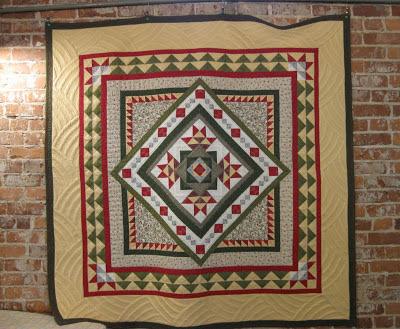 This beautiful medallion quilt employs a lovely red/green color scheme (who doesn't like this classic color combo?). It's spinkled with whites that add a freshness and sparkle and is complemented with a buttery yellow outside border. But what stopped me in my tracks... was the quilting. In true Margo style, the attention to detail was exemplary. I knew immediately (almost without having to ask) it was Margo's work. What I love about Margo's quilting is that she steps beyond the pieced block and superimposes another layer of pattern and design with the quilting. She changes a sawtooth border into a chain of squares on point. Large squares are transformed into 4-patches, and two parallel half round channels (almost trapunto-esque conduits), travel around the center medallion to emphasize the geometry of this symmetrical layout. 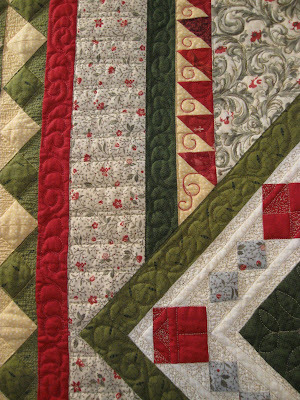 Corner detail of the machine quilting. The pseudo-Baptist Fan swashes on the wide outside border creates movement and dimension. 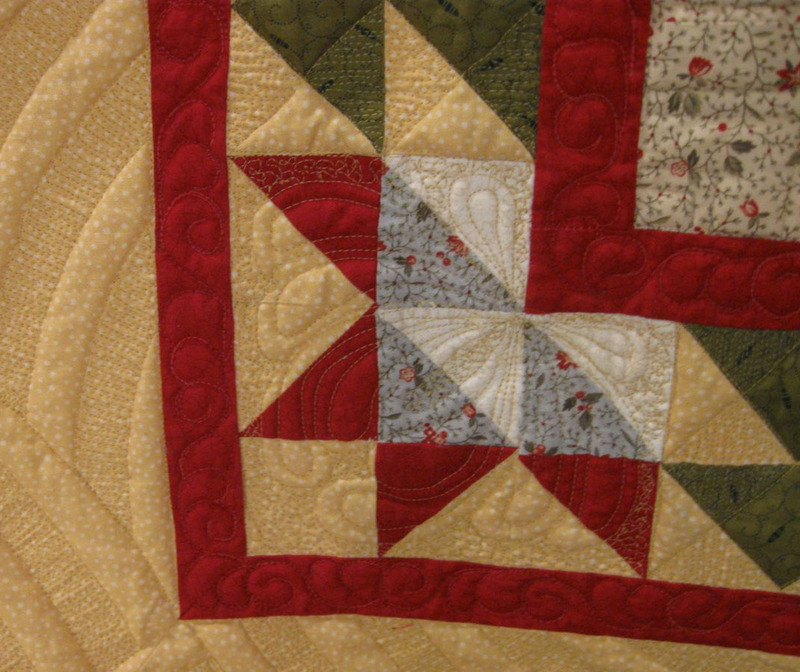 Upon closer inspection, you can see featherlike flourishes superimposed over half-square triangle patchwork. Margo performs her magic using a long arm quilting machine, but her quilting design sense is inspiring to anyone—whether you use a sit-down, domestic or long-arm machine. It's a honor to have friends with such talent. Gee, if they continue to let me hang around them, maybe some of their artistic flair will rub off. Ya think?